We are delighted to welcome Sestre to Eurofest on 13 November. Marlenna (Tomaz Mihelic), Emperatrizz (Damjan Levec) and Daphne (Srecko Blas) are better known as Sestre, the famous drag act from Slovenia. Sestre formed in 2000 and were initially known as the Suspender Sisters. In 2002 they began working with a new creative team and entered Slovenia’s search for their Eurovision entry, EMA. With their song “Samo Ljubezen”, which translates as “Only Love”, they came third in the semi-final and of course went on to win the final. They beat Karmen Stavec into second place and she went on to represent Slovenia at Eurovision the following year. The win wasn’t without controversy though – Sestre won the vote from the judges in the studio, but problems with the tele-voting meant that these were not taken into consideration in the final result. Nevertheless, “Samo Ljubezen” went on to represent Slovenia at the Eurovision Song Contest in Tallinn in May 2002. Sestre’s performance was notable for their matching flight attendant outfits and glamorous appearance – but of course we’d expect nothing less from these lovely ladies from Slovenia! They scored a respectable 33 points in the voting, finishing in joint thirteenth place along with Belgium and Bosnia & Herzegovina. 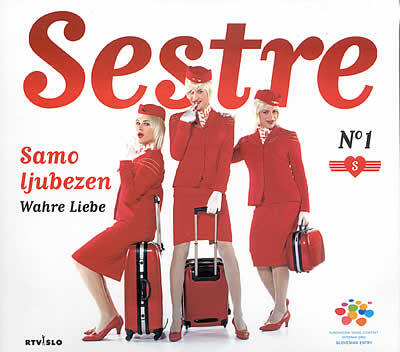 After Eurovision, Sestre have gone on to perform at shows and concerts across Europe. They even appeared on the TV show Eurotrash in the UK on Channel 4. We are delighted to bring them to London for their first performance in the UK for over a decade!